Marine Thread is the Glue of Boat Canvas. Be Sure You Know the Basics. How's the marine thread holding up on your boat canvas? Are you ready to sew, but not sure which thread will be best with your sewing machine? Are you a boater that believes that marine thread lasts forever? After all, it's outdoor thread right? There actually is one that lasts for the life of your boat canvas. It's a thread made with PTFE or Polytetrafluoroethylene, which is actually Teflon®. 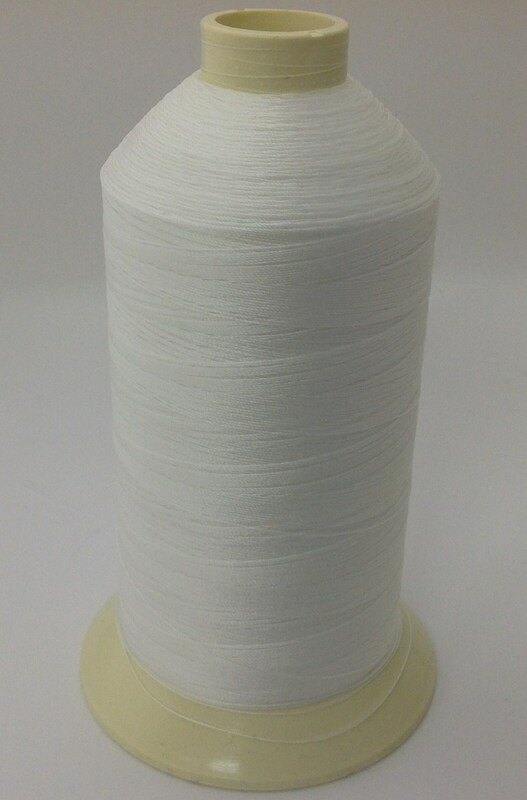 This type of thread can be exposed to sun, salt, chemicals, or pollution. It doesn't matter! It will last and last. Even thought this thread is super resistant to chemicals, that doesn't mean the thread can't break. It just means that this thread won't break due to exposure breakdown. Solarfix®PTFE has made a big competitive splash in the market and is what we use in our shop. Click here to see the entire Solarfix color selection. We are proud to offer lifetime Solarfix® 2000 Thread - Although we can't guarantee this marine thread will sew on your home sewing machine, it does sew nicely on our early model Kenmore and Bernina and industrial machines. I have been told that computerized sewing machines struggle with PTFE threads. Gortex® is associated with the brand name Tenara®. 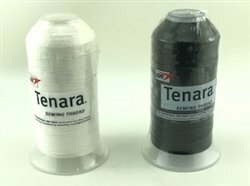 It was the first PTFE thread of its kind to hit the marine market. 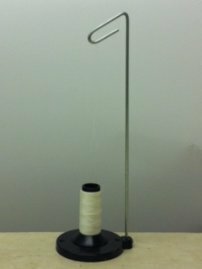 In the beginning, it was a flat fiber that most sewing machines could not accommodate. Over the years, they modified their process and came out with a twist thread that could be used with most sewing machines. Click here to see Tenara entire color selection. The reason you don't see PTFE threads being used in all marine canvas shops is because of price. At $160.00 per 1-pound spool, it's simply not offered by all fabricators. Thanks to PTFE thread, canvas boat covers can finally be made with the quality they deserve. what about the Other outdoor threads on the market? Polyester or polyester dacron is the most common marine thread you will find in marine canvas shops. They are UV resistant, and some are anti-wick which means that the thread has a lubricant that repels water and keeps the water from traveling down the thread and into the needle hole. This helps to keep the water from seeping through. These threads are considered chemical and heat resistant, but eventually weaken in the sun. The most important factor in keeping water from seeping through holes is using the correct sized needle with the right thread. Overly large needles will poke holes allowing water to seep through. Two common sizes used on boats are 92 and 138. Having used both, we can speak from experience and say without a doubt that 138 will outlast 92. If you have a choice, go with the heavier thread. All of the above come in many colors. For the DIY stitcher ready to sew your own project on a home sewing machine, you can buy Polyester 92 in 4 oz spools and Solarfix® 2000 in small spools with about 330 yards. Your home sewing machine may be able to handle 92 thread and Solarfix® 2000 with no problem using the largest needle your machine was designed to use, but it's very unlikely that you can sew with the 138 on a home sewing machine. Solarfix® also has a single strand 1360 which I have been assured works very well on home sewing machines. The next size down from size 92 is 69. Your home sewing machine will definitely be able to sew with it, but it won't hold up in the sun. In the south, you would be lucky to get a year out of size 69. If you use this size, plan on frequent restitching. What NOT To Use As A Marine Thread! Nylon thread is a bad choice for outdoor thread. Be careful when you have your custom cover made and be sure to ask what type of thread they will be using. We restitch plenty of covers that have been sewn with nylon. This happens frequently with auto trim shops and home furniture upholstery shops. Sometimes they just don't know any better. For more on canvas boat cover repair check out our web page all about boat cover repair. To sum up this discussion on marine thread, if you can have your cover stitched in PTFE thread then do it. You won't be sorry!